My last few blogs have been about hidden toxins in your products and how they may impact your pet’s health. Sticking to that theme, today I will be covering pet food bowls. I will go over hidden dangers that may be in your pet food bowls and which dog food bowls & cat food bowls may be the safest. I wanted to replace my dog’s bowls since I couldn’t get the red tea stain out of his bowl no matter how much cleaning I did. I started doing research for the safest bowls when I found out there are a lot of things to “be on the lookout for” when buying or replacing any of your pet items. In 2008 EWG’s research revealed the chemical exposure in pets is 5-20x’s higher than in humans. Some of the chemicals found were Teflon, fire retardants, stain preventatives, chemicals from plastics, chemicals in your bedding, tap water is loaded with chemicals, pharmaceutical, VOC’s and heavy metals such as mercury. Mercury itself can contribute to cancer, viruses, and bacteria. This toxic cocktail can lead to tumors, lipomas, cancer, thyroid issues, reproductive issues and more. 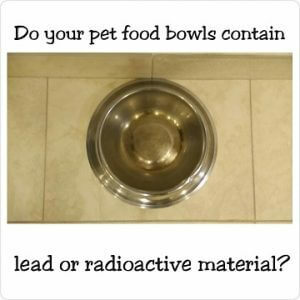 In 2009 HealthyStuff(dot)org did some research which revealed traces of lead in many pet items. In the 400 pet products tested, a fourth of them had detectable levels of lead. The most shocking results were that 7% of the pet products had lead levels over 300 ppm. In 2012 stainless steel bowls from Petco were recalled because of being contaminated with radioactive material. A study showed that plastic bowls and ceramic bowls had the highest amount of bacteria after a 14 day period. Some of the bacteria found were MRSA and salmonella. There were some concerns expressed of bacteria being transferred between pets and humans. This is referred to as Zoonotic diseases or zoonosis. How I reduce bacteria: I change the water twice a day. I wouldn’t want to drink water that has been sitting out all day or overnight. Also, I wash my dog bowls in hot soapy water regularly and I also use my steam mop attachment to kill bacteria and sanitize the bowls. I was considering switching to ceramic dog bowls but I quickly learned they are prone to chips & cracks that can harbor bacteria and the glaze may contain lead. I thought about taking the time to research ceramic bowls that have a lead free glaze but I quickly remembered the worrisome feeling I would have when dealing with heavy ceramic dog bowls. What if I drop it? That is going to be one big mess! Plastic bowls were not even a consideration because they have their own problems like BPA. Additionally, my dog would get acne or a pimple like bumps on his face when he was exposed to plastic. I was beginning to wonder if there a safe dog food bowl? It seems there is not much or any regulation when it comes to pet bowls. Now I need to find something lead free and radioactive-free. Sigh. Finally, after several hours of searching, I did find stainless steel pet food bowls. Yay! Bowls from each batch are tested! Click here for Test Results. It pays off to get a good quality dog bowl! Both of the bowls in the picture to the right —-> are 1 year old. Look at the difference!! The bowl on the left is a “cheap” bowl that has rusted and “flaked” off material that possibly was ingested by my client’s dog. The bowl on the right is the bowl featured in this blog. It does not have any rust and looks fantastic! If you’re like me, you might be wondering what does 18/8 or 300 series mean? I was told many stainless steel pot & pans are 18/10 but I still had no idea what that meant. 18/8, also referred to as type 304, is composed of 18% chromium and 8% nickel. The short version is this combination helps to prevent corrosion and oxidation resistance. Getting quality Cat food bowls and Dog food bowls that will last a long time and are made in the USA comes at a price. WHY? Outsourcing production and inferior materials allow for bowls to be the cheap price you may be used to. Cost: If you’re looking for the cheapest priced bowls, these are not it! These bowls should be a 1x investment vs. other bowls you would likely need to replace within 1-2 years, which costs you more in the long run! 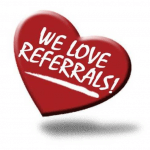 More importantly, considering all the things your pet won’t be exposed to, you will have a healthier pet and fewer vet bills. I look at it like this, I bought an ‘expensive’ water bottle for health reasons so I can justify buying the same for my dog. Besides I’m sure my dog’s bowls will last much longer than my bottle so the $34.99+for a set (2 bowls) is a good investment to me! Sizes: These pet bowls are offered for both cats and dogs. The dog bowls come in Small bowls, Medium bowls, Large dog bowls and Extra Large bowls. They also offer a mixture of sizes such as set containing 1 medium and 1 large bowl or 1 small bowl and 1 medium bowl. 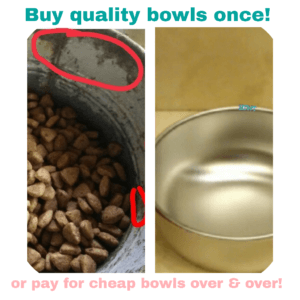 I hope this blog helps you pick safe bowls for your pets! Don’t forget to properly clean your bowls and prevent that dreaded slime, you’ll need to use super hot water. The water from your tap or dishwasher will not get hot enough. *Bacteria are killed at high temperatures, see my steam mop blog for further details. Tips: For other tips on how to polish your bowls and why you might want to rotate your bowls, read the dog bowl review I wrote after using these bowls for several months. BONUS, there is a blooper video! Who doesn’t like bloopers right? !